I just meant that it worked nicely there and you'd chosen well. Absolutely, Alan, and a good sense of humor helped form an interesting look at the page. This The Avengers wheel was really important there, since it was the main attribute of the site The Avengers Declassified, and it let to understand of the current way of your relationship with the Avengers. Even more importantly, I think it also made sense of how deeply you were involved in the development of this page. Yes, dear fans, each picture element on the interview page is not just a decoration, but it's part of the overall theme. We did it with Alan in the same manner in which worked, for instance, TV show "This is your life". I think that the decor here, like the cover for the book, stage props, and so on, because we wanted as close as possible to present result in a single composition for the people. Site Steedumbrella begins a series of interviews with various people associated with The Avengers, TNA and their performers. The first "episode" will be presented to the public on November 29, 2014 in English, German and Russian language. Guest: Gabriel Hershman, author of book Send in the Clowns - The Yo Yo Life of Ian Hendry. Interviewers: Denis Kirsanov, Alan Hayes and Christine Stutz. The interview covers a different topics, the main ones are the personality and career of Ian Hendry, and a book Send in the Clowns - The Yo Yo Life of Ian Hendry. As an exclusive interview, Gabriel told some things that had never told the public before. Interview with Gabriel Hershman, Ian Hendry's biographer, on Steedumbrella. Interview is in stage "post-production". Alan Hayes and I selected 36 Q&A for the final version on Steedumbrella. Photographic material will include an interesting photo with Gabriel Hershman. When quoted in later years, Patrick Macnee was often ambiguous on the topic of his favourite “Avengers” partners, so as not to denigrate any of his female colleagues. It served as a curiosity for many when Patrick called Ian Hendry his most favourite partner. I suppose they did have something magnetic together on screen. How do you view Ian and Patrick’s friendship and why was it so special? It's interesting that Ian and Patrick got on so well. Their screen personas were quite different. Patrick was suave, sophisticated, debonair, smooth, elegant, dandy-like and upper-class. Ian - although similarly educated in the private sector in the UK - was more the rugged, streetwise, rough diamond type. But they complemented each other very well on screen. Off-screen, there was a lot of mutual ribbing and joshing but they clearly liked each other very much. Ian and Patrick both liked Scotch. This apparently helped to cement the friendship! I think that Patrick respected Ian's contribution to the scripts and respected his creative input. I wish I'd been able to interview Patrick for the book but I decided against approaching him on account of his advancing years. I think that Patrick was not exactly angry but slightly irritated that Ian's contibution was often overlooked in discussions of “The Avengers”, so he liked to mention Ian's contribution whenever he got the chance to rectify this. It's fitting that Ian's last public appearance was on Patrick's “This is Your Life”, but Ian's appearance was rather fleeting compared to Patrick's other co-stars. This reveals how people somewhat undervalued Ian's contribution. I hope that this is now being rectified!! November 29 - interesting pastime on Steedumbrella, we are waiting for you. Is pleased to announce that an exclusive interview with Gabriel Hershman (author of a book about the life of Ian Hendry, Dr. Keel in the Avengers) now online on Steedumbrella. Interviewers: Denis Kirsanov, Alan Hayes & Christine Stutz. Gabriel also spoke about the incident Ian with Honor Blackman and sent a photo where he is wearing a Ian's hat from the film The Hill. All this on Steedumbrella in the "first episode" of the planned series of interviews with people involved in The Avengers or related to the performers. Important note - as for flash intro should be turn on the sound on your computer. P.s./ Flash intro will be on Steedumbrella until Monday. This is a really fascinating piece Denis-it is a must read for any Avengers fan. And you did a most professional piece of work here. Thank you so much! You really have an incredible sense of humour! I have never seen any TA video of this professional quality. Having both music and cartoon captions with real dialogue one can imagine TA saying in jest is hilarious. I watched it several times it was so good! Keep up the good work! Very pleased to hear this, Anti. In fact, this flash animation was made by Chris, webmaster of the site John Steed's flat, and there was only used a small piece of my idea for the plot. Well, just my script was not good enough and idea's Chris, posted on site, was more interesting. ...Black screen. Phone call. 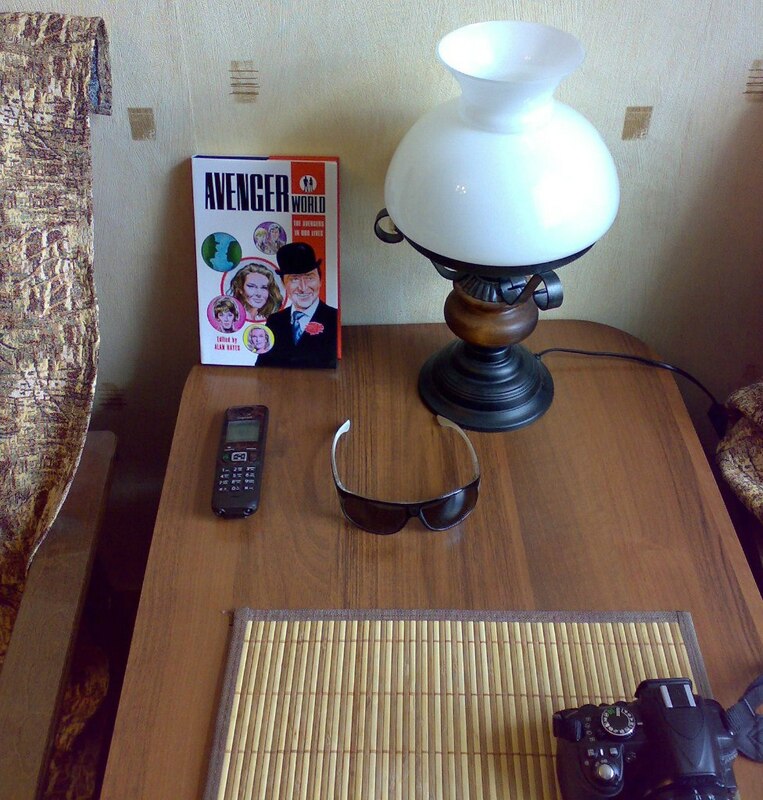 Steed includes a table lamp and picks up the phone. - Steed, are you still sleeping? Look what time it is! - Still very early, Mrs. Peel. - You've already gathered the guests? - Steed, I'll be in the studio in an hour! Steed hangs up and looks at the newspaper on the table that says "October 31 - Studio Guest: Gabriel Hershman." soon find themselves in the studio nearly the door with the inscription "Steedumbrella". They open the door and go in a completely dark room. - Steed, we go in the right door? - We still have 5 seconds until start, wait and find out. Then the screen shows the studio and in a large shot book about Ian Hendry. Under the book is inscription: Guest Gabriel Hershman. To go to the interview, click on the english flag on the news page Steedumbrella. Things have changed very much later. Firstly, there was made another animation variant , but then we decided to postpone it for the next interview. With regard to the curent variant, there was made about 10 variations with minor changes, and eventually the latter variant was obtained (SURPRISE) before half an hour before the scheduled premiere! So I posted the flash intro almost at the last moment. It was a great experience for me to do this interview and there were a lot of funny incidents in general, when we did it. For example, there was a very funny moment, when I with Alan decides where to place the photo with Gabriel, under inscription "Gabriel Hershman" or above. But it was important, as we have thought through every detail. So, at some point there was a moment of fatigue and I thought, need to remove photo with Gabriel, at all. But eventually Alan did a choice..
Well I actually like your better. But they are both rather clever. That must have been so much fun! I think is probability that we use the draft of the script for one of the flash video in future. Glad that you found these stories rather clever and we'll sharpen others in this way. There were many memorable fun moments, such as for a banner, was very a lot of options as text will be placed in it and eventually we stopped at the first variant, at all. Steedumbrella Today and for the next week! On page are the hidden references to the official Patrick Macnee site, to the article "Wonderful Mr Macnee" (tribute by Alan Hayes and Richard McGinlay), and to the site The World of Patrick Macnee. P.S./ Despite the shortcomings of Google translator, at the moment it's still the best online program for translation from Russian to English. A nice addition to the episode page was a review of Olga Svecharnik, who recently resumed its activities for the site and is now working to review the episode Death at Bargain Prices. Very nice work, Denis! Merry Christmas to all involved in Steedumbrella! It is interesting that initially I had not planned to make the announcement to the page of this episode, because I was able to make very few new research, but in the end, when it became known that Olga will present a new review (oh, much time has passed since her last work for the site) I decided that I must do it. How did you spend Christmas, Alan? I guess it was a wonderful day. It was. Spent with family in Kent. Though this meeting was actually rather as sort "banquet with friends" - we unwittingly plunged into nostalgic memories of the joint youth days, creativity, work and other memorable events - Aleksei Sidorov prepared huge surprise. 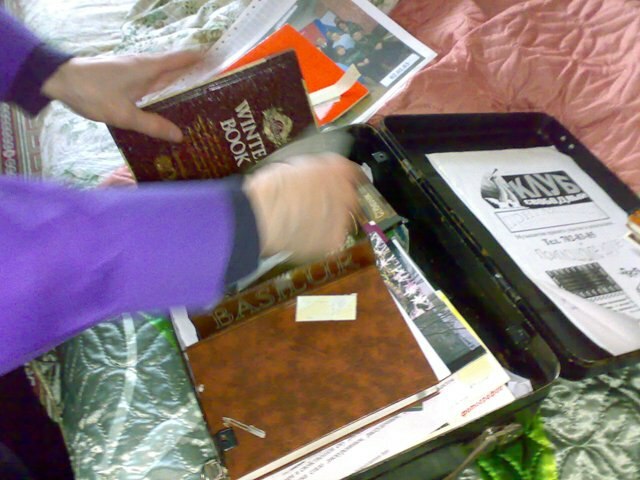 Aleksei took us to his private room, where from nightstand he pulled some black suitcase and leisurely began to open it. He winked mysteriously, that we have become intriguing to speculate that this might denote. Suitcase was opened and our eyes seen a pile of various papers and a some magazine. Who would have thought - when I opened the magazine, there were records of Russian fan club participants in House Culture "Yauza" for a few dates since 2000. It turns Aleksei led a secret journal, in which he even wrote the phones of visitors of fan club in order to be able to contact them for further participation. Also we found unknown photos in the fan club, poster of fan club, rules of fan club, composed by Sergei Pronin and ONE unknown unfinished story from Aleksei about Steed (unfortunately Aleksei was unable to determine when he was written it - even approximately). I think if someone was shooting a scene with a suitase on a video camera - this would was sparkling comedy: as soon as it became aware of the content of the "bag", every one (except owner) attacked a valuable object and began almost to tear it apart by studying different papers. Aleksei soon abandoned the attempts to "pacify" the public and excited shouts, very possibly could be heard even in the street (all occurred near the balcony on the 4th floor). Overall had a good holiday, Aleksei proposed to meet again in August and hold the event properly. 2. Aleksei read the new chapter from the novel "Finger of fate". 3. Surprise in suitcase. (Greatly, that Aleksei let me take his unknown unfinished story about Steed in own archive - I should admit, this is only three pages of text, story titled "Night comes quickly". Steed is investigating in the English countryside. That the investigation - is unclear). Think, I will to post the news on site, when photographic material from event will sent on email. On moment, photos from other Aleksei - A. Arsentiev. Yes, it was a fun and memorable day, Margo, planned that next meeting will be in July. Possibly Aleksei will prepare a few more pages for his last fanfic of Steed + we are going to do another photo shoot with the "Avengerworld". Tomorrow courier should bring me the package - this will third copy of this book in Steedumbrella group. If all goes well, in photo shoot will take part April Kane (founder of the group The Avengers in VK) and some other Russian fans, one who participated in the book, other who did organization for Moscow event - Series The Avengers (two episodes) on the big screen. 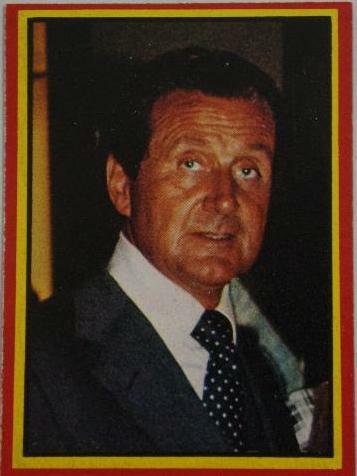 Just posted Spanish card with Patrick Macnee by publishing house Ruiz Romero. Curious, found that card with Linda Thorson from same album is listed as "Los Vengadores - Johanna Lamley".